Tim Wu, the professor at Columbia Law School who coined the term “net neutrality,” is the author of an important and extraordinarily well-researched and well-written new book titled The Attention Merchants: The Epic Scramble to Get Inside Our Heads. In it, Wu traces the entire history of the technology-enabled work of merchants—those who wish to sell us something—to dominate our attention and, in so doing, to create demand for their products and services. From the snake-oil salesmen of old to the more pervasive, less noticeable, and more effective methods that define today’s Web experience, this book takes us on a comprehensive and insightful journey through the entire history of advertising and explains how the efforts of attention merchants have not only created demands that artificially dominate our lives, but have also gotten into our heads in ways that have fundamentally changed who we are. Even though Wu’s concerned that attention-grabbing technologies have had ill effects, this book is not a screed. It exudes the even-handed tone of a scholar. Wu lays out the facts without preaching, but his concern is nonetheless evident and pressing. A good life and the sensible decisions that enable it are hindered by the onslaught of distractions that dominate most of our attention today. The constant tug of social media, ubiquitously accompanied by increasingly targeted advertising content, leaves little room for reflection. It exercises its influence largely at an unconscious level. As the world fills to overflowing with unremitting noise, our lives are impoverished. We have traded our attention for hollow promises of useful content and experiences: a Faustian bargain. The dominant attention merchants of our day, Web-based services such as Facebook and Google, have a self-serving agenda that is much different from ours, but that isn’t obvious without finding a moment of stillness in the eye of the storm. Several authors have written about the battle for our attention that is being waged against us today, including several whose books I’ve reviewed in this blog. Tim Wu has added significantly to this lexicon by telling the chilling story of attention merchants. We can choose to opt-out of this Faustian bargain that we’ve inadvertently made, but it isn’t easy. By reading The Attention Merchants, you will learn about the main forces that have created this problem—all familiar names—and this knowledge will equip you for battle. Hello Steve, Thanks for this recommendation and I love reading your book reviews. You are a good writer and are able to convey your thoughts in a clear concise manner. I will read this book, but may I recommend a book to you? It is called “Trees on Mars: Our Obsession With the Future” written by Hal Niedzviecki. This book essentially talks about companies trying to innovate for what may happen in the “future”. Mostly this is seen in startups trying to better mankind with a new smartphone app, funded by Venture Capitalists, and “inspiring” every company and institution to believe they have to act like a startup in order to innovate and be successful. The result being the massive disruption in systems, employment and noise we have today. Keep up the great work and this blog, as I have learned a lot from it. Thanks for the kind words and for the book recommendation. I just now ordered a copy. We pay extra for seats on flights that provide a little extra legroom. On a long flight, especially, it’s often worth it. Similarly, we’re sometimes willing to pay extra for software services to eliminate the annoying advertising that degrades the experience of the free version. Think of the omission of ads as attentional legroom; it eliminates unwanted distraction. This model is built on the assumption that advertising is ubiquitous and we should be willing to pay to eliminate it. Advertising has indeed become ubiquitous, but this need no longer be the case. We can turn this on its head, and perhaps we should. Marketing, in some form or another, has always been with us. The only valid argument that has ever been made for marketing’s existence, other than by those who profit from it, is that without it we might not be aware of useful products and services. This argument, in light of the waste of time and attention that marketing imposes on us today, is razor thin. Now that we live in a world that gives anyone with a web-capable device the means to easily find whatever products and services they desire in an instant, the thin justification for marketing’s existence has vanished. Whether or not proactive marketing has ever been justified, it isn’t any longer. It robs our valuable attention, it creates demand for things we don’t need, and it is often deceitful. Marketing remains because those who do it are working hard to impose it on us for their exclusive benefit. I would prefer to live in a world that prevents all proactive marketing, limiting information about products and services to resources (e.g., websites) that provide that information and nothing more in a way that can be easily searched. In other words, I would like to see all “push” marketing eliminated in favor of “pull” marketing alone. Sources of marketing content could be prevented from hosting other content or services that might be used to lure us there and only allowed to deliver information upon request. Would we be impoverished in the least by this arrangement? I don’t think so. The benefits in freed attention and protection from harmful lies would be enormous. Must products and services engage in proactive marketing to survive and flourish? Not if they’re good. A world without proactive marketing would be simpler. With more attention at our disposal, we would see the world more clearly and make better decisions. I’d like to live in that world. I agree with your sentiments and, I believe, share your feelings and concerns about marketing. But I cannot agree with your recommendation – assuming you are actually advocating for a ban, or other regulatory action, against proactive marketing. The dangers of having any government take such action are just too serious. In the wrong hands (a situation that is sure to occur at some time), the power to decide what people should or should not be exposed to strikes at the heart of the constitutional rights that are critical for us to live as free human beings with dignity. I don’t disagree that our “freedom” is interfered with by proactive marketing. Consumers are often acting out (often unconsciously) what marketers have steered us towards. But who is to decide what is our free choice and what is not? If, as you say, we’d be better off to live in a world without proactive marketing, then people can choose to do so (admittedly with more difficulty than it should take – I often cringe at how difficult it is to rid myself of unwanted marketing). In fact, the difficulties are large enough to make me sympathetic to the idea that our government should protect us against such evils. But surely you cannot be advocating government action to do this? If you are not calling for regulatory action, then who is your appeal to – the public or the businesses that choose to do this? Both? I wholeheartedly agree with that appeal, but I am not optimistic. Whenever I tell a business that I do not like their business practices (take any cable or television provider as one example), I know my refusal to continue to do business with them is a message they do not hear or care about. You want to live in a world that prevents proactive marketing – so do I. But the question is what type of world would prevent this – one where the government prevents it (not a world I want) or one where consumers prevent it through their collective actions (a world I would like but is not going to happen)? I’m not suggesting that the government should restrict access to anything. Rather, I’m suggesting that proactive marketing be banned. Anyone who wishes to access marketing content would have that right, without restriction. I work hard to shield myself from marketing, but I shouldn’t have to. Despite my vigilance, I’m confronted with marketing everywhere that I turn. Should a ban on proactive marketing be legislated? I consider this well within the scope of useful government. I also believe that legislation is the only way this can be done. If it were, would that give the government an opportunity for mischief? I fail to see how it would. You are assuming that there will not be legislation prohibiting Dale Lehman from raising issues in class that might hypothetically upset a student. I am not so sanguine. I’m assuming nothing of the sort. How does a student raising issues about you in class relate to this matter? Legislation, based on a somewhat compelling moral argument (that proactive marketing is bad; that some speech hurts people, etc. ), is hard to contain to only restricting behavior that you and I may find unethical and destructive. I can easily agree with you regarding the destructiveness of proactive marketing and legislation to ban it would indeed make my life simpler. But I fear that using legislation in that way could also be used to restrict my free speech – which may, in fact, be destructive and bad for others. I am not claiming a desire to engage in such speech, nor am I trying to assert it is right for me to engage in it – but there may be times that what I feel I want to say will conflict with someone’s feelings and hurt them. I strive to not have that happen – but what worries me is the idea that it would somehow be ok for legislation to restrict my free speech in that way. If you don’t see the connection, perhaps I am missing something. But I believe proactive marketing is protected by free speech just as is mine. As I suggested previously, I’m not advocating the restriction of free speech. Rather, I’m proposing that no organization should have the right to force their marketing content on me if I don’t want it. I should not have to waste my time and attention working as hard as I must to avoid it. A restriction on proactive marketing would have no bearing on your right to teach your classes unless you’re using class time to market products and services to students without their consent. I can’t imagine that you’re using class time in this manner. Let’s keep this discussion focused on the topic at hand. I agree with you that proactive marketing should be banned or controlled in some manner. They did ban subliminal messaging in advertising, bait and switch and false claims about a product. Also here in Ontario we also have a constant battle of minimizing or preventing roadside billboards. I believe in the US some States allow them while some prohibit them, without restricting anyone’s freedom. Don Draper (Mad Men) and his ilk are crafty and have negatively contributed to our society. Unfortunately we as individuals have to be more vigilant than ever, not be taken in by the hype and do what we can to ignore it. I’ll stay on topic here. Bans on bait and switch and false claims? I call bait and switch the new American business model (just look at any cable company, satellite television, streaming TV service, etc. for easy examples: low price, small print says for 1 year, then annual increases thereafter – and the increases are not small: the end result is that you end up paying twice as much within a very short time frame). So, if these practices are “banned,” then bans are clearly ineffective. If they are not really banned, then I guess the sentiment is that they should be. I still don’t agree. As reprehensible as I find these practices, I don’t see “banning” them as good policy or effective. Legislating morality is not the same thing as morality. We establish and enforce laws, not to make people moral, but to motivate them to behave as if they were. I doubt that you oppose legislation in general and would prefer live in a world without laws. If your primary objection is rooted in concern that a ban on proactive marketing would be difficult to enforce, that’s worth considering. Unfortunately, I can’t contribute much to this particular discussion because I’m not a legislator, judge, attorney, law professor, so I lack relevant expertise. Unless you possess this expertise, it would probably be best to leave this discussion to others who do, such as Tim Wu. Well I do have expertise in some of these areas. As a regulatory economist I have studies how many regulatory and legislative actions work in practice. Let’s take one specific practice you have singled out – and one that I would agree is evil and bad. I particularly dislike bait and switch and it is now the way that all television services are sold – virtually all of them. It is done because it works and is profitable. Consumers love the “deal” of the low initial price and many of them (include me here) don’t or can’t read the small print enough to realize what they will end up paying. But the question is: would it be good to ban such practice? I think not, as so many consumer protections just lead to ever more subtle ways to taking advantage of consumers. The larger issue is one you raise: using laws to motivate people to behave “as if” they were moral, not to make people moral. I have long been a student of environmental policy and I do favor legislative acts, such as the Endangered Species Act. However, I have never found the argument satisfying that we can use environmental law to make people act as if they valued the environment (for its own sake rather than in utilitarian terms). I lament the fact that many people do not have these values and don’t believe that legislation can make up for that. What legislation can do is call for an open discussion of the issues and values involved, and if action is warranted, it is then a collective statement of those values. So, I’ll backtrack a bit (hey, if the POTUS can do it, I certainly can) – I would welcome a Congressional discussion of whether or not proactive marketing should be banned. If the values involved were really discussed, and legislation resulted, I guess I would think that was a good thing. But I’ve seen very little discussion of this nature in the past 50 years. Almost all of the discussion is now utilitarian – would I be better off if we passed this legislation or not? In this atmosphere, I don’t see a ban on proactive marketing as a good thing – it would simply represent one group asserting its power over another. And, even the banned practices would likely show up on more subtle, but equally nefarious, forms. If there is an area of agreement between us, I believe it is that discussion of the ethics of practices such as proactive marketing are important and a worthy enterprise for political discourse. If there is an area of disagreement, it may be that I am even more skeptical than you – and in view of that skepticism, I don’t see legislative action as an improvement. 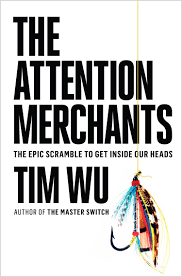 I really appreciated your review of Tim Wu’s book titled The Attention Merchants: The Epic Scramble to Get Inside Our Heads. One of my “hobbies” is teaching and I have been blessed with the opportunity to build and teach a class from scratch for the MBA program at Pepperdine University in Southern California. I have adapted two of your books (Information Dashboard Design and Show Me The Numbers) along with the Storytelling with Data text by Cole Nussbaumer Knaflic. Since my class is focused on communication with data I am integrating a number of suggested readings that will help guide the students get perspective on data-related communications. Based on your review I am inclined to make some specific references to Wu’s book after I read it (which I hope to do soon). Thank you Steve for the well-written review on Wu’s book and for the previous work on your books which I’ve been able to draw from in building lectures and assignments for my classes.